The top spots for two MATCH Series divisions already are secure, but races on the final weekend will determine the standings in other divisions as well as the overall championship. Two divisions—the 3-Year-Olds and Up Sprint—Turf Division and the 3-Year-Olds and Up Sprint—Dirt Division—remain wide open heading into the Sept. 15 final legs at Laurel Park. The standings reflect the importance of participation in series races, and a few horses have an advantage because they're eligible for bonus points. 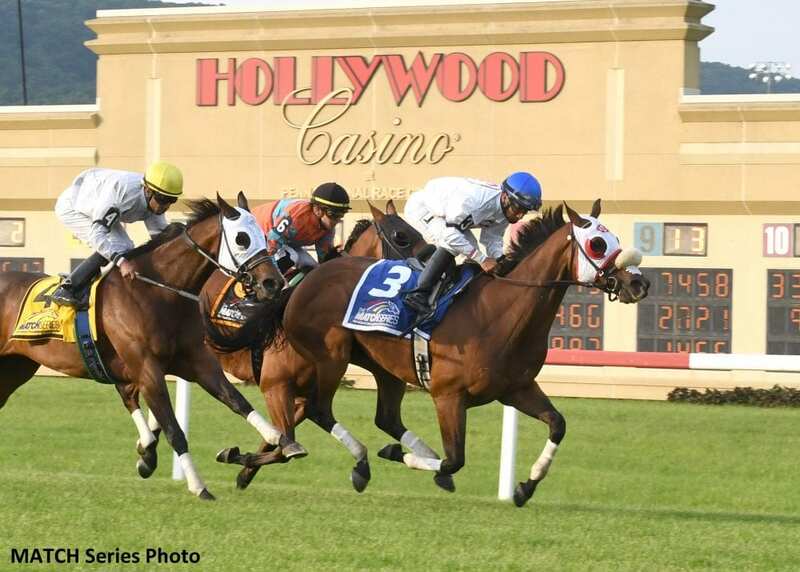 Oak Bluffs, an 8-year-old New Jersey-bred gelding, has raced in the first four legs of the 3-Year-Olds and Up Sprint—Turf Division and leads the standings with 22 points. If he competes in the $100,000 Laurel Dash at six furlongs on the turf, he will automatically earn 7 bonus points on top of points collected for finish position. Oak Bluffs, who recently worked a half-mile at Pimlico Race Course, is owned and trained by Mary Eppler, who already claimed the 3-Year-Olds and Up Long—Dirt Division with now-retired stable star Page McKenney for owners Adam Staple and Jalin Stable. Page McKenney isn't in the hunt for the overall championship anymore, but Oak Bluffs remains in contention. Both Eppler trainees also have earned their breeders a $5,000 bonus. Oak Bluffs, bred by Patricia Generazio, is the top New Jersey-bred colt or gelding, and Page McKenney, bred by co-owners James Bryant and Linda Davis, took honors in the Pennsylvania-bred colt or gelding category. The bonuses are provided by the Thoroughbred Breeders Association of New Jersey and Pennsylvania Horse Breeders Association, respectively. Imprimis, owned by Breeze Easy and trained by Joe Orseno, has won both of his MATCH turf division starts and has 20 points. His connections, who have an eye on the Breeders' Cup, entered the 4-year-old gelding in the grade III Turf Monster Stakes at Parx Racing Sept. 3; if he races in the Laurel Dash he would qualify for bonus money. Colts Neck Stables' Pool Winner (19 points), trained by Alan Goldberg, and Pewter Stable's Dubini (12 points), trained by Kathleen Demasi, both have three starts in the 3-Year-Olds and Up Sprint—Turf Division and thus would automatically earn 5 bonus points in the Laurel Dash. Pool Winner also was entered in the Turf Monster. Another Maryland-based horse leads the 3-Year-Olds and Up Sprint—Dirt Division and also would earn 7 bonus points for starting in the grade III Frank J. De Francis Memorial Dash at Laurel. Laki, trained by Damon Dilodovico for owner Hillside Equestrian Meadows, is the division leader and overall points-earner thus far with 23 heading into the fifth and final leg. Like Oak Bluffs, Laki hasn't missed a MATCH Series start and hadn't finished better than third until the Aug. 12 Polynesian Stakes, in which he was placed first after a stretch-long battle with Lewisfield, who finished first by a nose but was placed second. Lewisfield, owned and bred by Linda Zang, has 19 points and would earn 5 bonus points for a start in the De Francis Dash. Lewisfield and Laki, bred by Tom Michaels and Lorna Baker, are both Maryland-breds, so their breeders are eligible for a $5,000 MATCH Series bonus for the top Maryland-bred colt or gelding by points in the overall standings. The 3-point swing between first and second in the Polynesian certainly could be a factor in the final standings for the division and breeders' bonus as could the field itself—the connections of X Y Jet and Imperial Hint, both of which are being pointed to the Breeders' Cup, have indicated interest in the De Francis Dash. Sycamore Racing V's Jessica Krupnick, yet another Maryland-based runner (Fair Hill Training Center) for conditioner Francis “Tres” Abbott III, made a long round-trip to Erie, Pa., count when she sealed her division title with a third-place finish in the Satin and Lace Stakes at Presque Isle Downs & Casino Aug. 20. Abbott penciled in the $100,000 Roamin Rachel Stakes, final leg of the Filly and Mare Sprint—Dirt Division, at Parx Racing Sept. 15 for the 5-year-old mare. Jessica Krupnick has 22 points and would be eligible for 5 bonus points with a start in the Roamin Rachel. Liz's Cable Girl, a New Jersey-bred 4-year-old filly trained by Pat McBurney for owners John Cocce, Lisbeth Dodd, Peter Donnelly and Gerard Melley, needs one more MATCH start to qualify for bonus money and the $5,000 breeders' bonus for top New Jersey-bred filly or mare. Bred by Colonial Farms, Liz's Cable Girl won the restricted Eleven North Stakes at Monmouth Park Aug. 26 and would enter the Roamin Rachel off of back-to-back victories. In the Filly and Mare Sprint—Turf Division, impacted by two off-the-turf stakes in the first and fourth legs, Audley Farm Stable's 4-year-old filly Smiling Causeway leads with 12 points, but she needs to start in the $100,000 Sensible Lady Turf Dash at Laurel Sept. 15 to qualify for bonus money. Like Imprimis and Pool Winner, Smiling Causeway was entered in the Turf Monster; trainer Arnaud Delacour earlier said the farm would like the filly to get a graded-stakes victory on her resume. This entry was posted in NL List, Racing and tagged imprimis, jessica krupnick, laki, laurel park, mary eppler, MATCH, match series, oak bluffs, page mckenney, pool winner by MATCH Series Release. Bookmark the permalink.